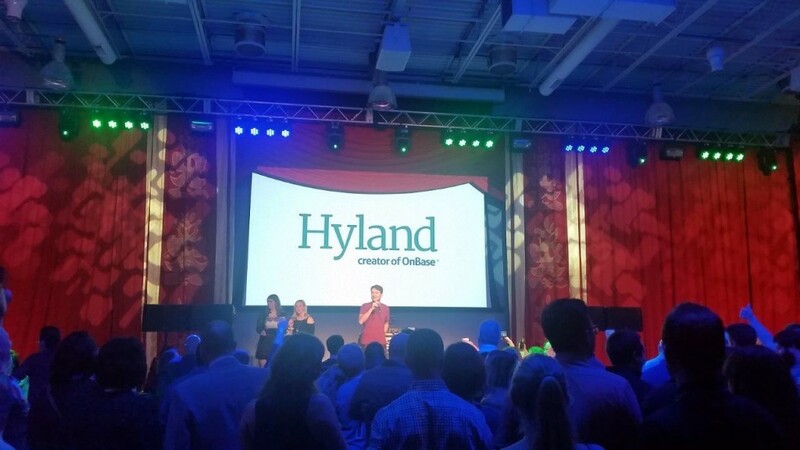 So, you’ve gotten two bids on new custom stage curtains, and one quote is lower than the other. What could be the differentiating factor between two otherwise identical quotes? The fact is, there is no easy way to know if a lower price is better, and so in my opinion, decisions should be based on more than price. Yes, price has to be considered, especially in light of today’s economy. But it shouldn’t be the only consideration. Does one company have a reputation of offering superior workmanship? Has one company provided timely, prompt customer service? Have you received fabric samples from both vendors and, if so, are the fabrics identical, or does one fabric appear to be of higher quality? After evaluating all of the factors – price, product quality, company reputation, customer service – you will then be able to make an informed decision as to which quote to accept. You may still choose the lower quote, or you may decide to choose the other bid despite the higher price. Either way, you will feel more comfortable with your decision in the long run. Don’t worry – you aren’t alone!. Plenty of people want just the short and skinny when it comes to the “what if’s” of renting with us. I love the green storage bag my drape came in! Can I keep it? Yes, you are very welcome to keep the bag with our compliments. We just ask that you be sure to return our drapes in a manner that keeps them free from dirt and damage. We don’t have a “stock” rate since each rental price is determined based on fabric type, size, and sewing details. Please contact a sales associate for a prompt quote. What is the Optional Damage Waiver? Occasionally, @#$& happens. Rather than force you to eat the repair costs (which can eat into your budget), we offer a small Damage Waiver protection fee when you place your order. Then, if something bad happens to your drapes, we will make repairs at no extra charge within the limit specified on your order. Lost items are not covered, however. Please see full details in our terms & conditions document. What happens if a drape gets damaged? Give us a call. We will repair or replace it to keep your production on schedule. If you have purchased the Optional Damage Waiver, your repairs will be covered within the limits described on your order. If not, a fee will be charged for the repairs. What happens if I lose an item from my rental? Again, contact us. If the item was stolen, a police report should be filed. If the item is lost, we will replace it at the cost cited on the order. Lost items are not covered by the Optional Damage Waiver. The tour was cancelled and I need to return the drapes early. What is the process and what fees are involved? You can return your drapes early, or before the end of the contract term. Please advise us of any change in your rental schedule as soon as possible so we can arrange a prompt return. After receipt and inspection of the drapes, applicable fees will apply for the period used (minimally 1 week) and you will be charged a restocking fee of 30% of the balance of the total contract rental order fees. I need something custom, and you don’t have it. What do you suggest? Talk to us. We may be able to create and rent custom items depending on the term of rental and design. Or, you can talk to our custom sewing company, Sew What? about buying something spectacular. Is delivery included in the cost of my rental? Delivery is not included unless specifically noted on your order. We can arrange the most economical shipping method and add the cost to your order, or you may independently plan for the pick-up and return of your order to our facility. Are the drapes I am renting flame retardant? All of our drapes are certified as flame retardant by the manufacturer, and have been treated with flame retardant chemicals (FR) or were woven of flame retardant fibers (IFR). A flame certification will be sent with packing slip. See more on flame retardant fabrics and drapes. Tour managers know the challenges of finding adequate facilities for talent and crew while on the road, particularly in providing staging at outdoor or non-theatrical venues. At Rent What? Inc, we have created an innovative portable dressing room that solves multiple needs, simply and affordably. If you haven’t used our portable pop up dressing rooms before – here is a little more about them. 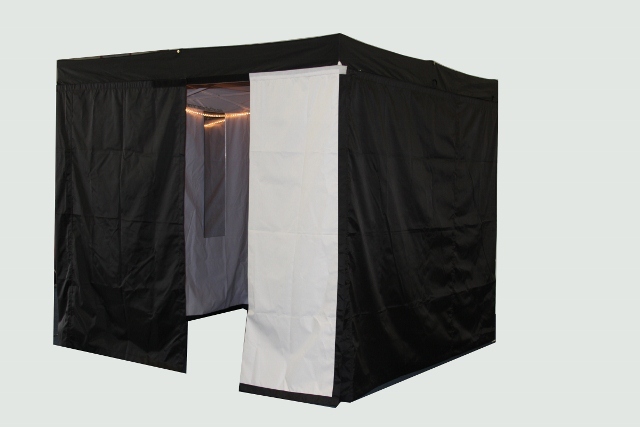 These easy to use and portable privacy spaces have been a significant boon to any number of our rental customers. We created this portable dressing room to solve the problems of one customer and immediately discovered how many exceptional applications it has, from dressing room to tech area to green room. Indeed, the portable dressing rooms have already been in use since 2010 when first introduced into the rental inventory line-up. Excited to share that they have graced tours over the years including Glee, Jay-Z, KISS, Motley Crue and Conan O’Brian. The pop up private dressing rooms have also been utilized for numerous special gala events, premiere openings, and outdoor theatrical events such as Shakespeare in The Park. In addition, several venues have rented multiple units for long-term use, including the Nokia Theater in Los Angeles, California. In designing the product, we went the whole path, thinking through the assembly, the rolling cart, the accessories and the shipping. We wanted a complete package, and something that doesn’t look like one of those garden tents or swap meet booths that have been the only solution until now. It had to be professional, practical and made exclusively for real productions. Moreover, getting away from the unprofessional look and lack of privacy that a “pipe and base” dressing room provides – this all-in-one with side wall wrapper design brings user experience and audience views to mind as priorities. How does the portable dressing room function? In less than two minutes, a complete 8’ x 8’ workspace, including lighting and mirror, can be set up anywhere. Here’s a video that shows just how simple it is! The dressing room’s pop-up assembly is built on a heavy duty industrial frame, and is lined with opaque, water-resistant Roadura fabric milled especially for Rent What? by drapery manufacturer and sister company, Sew What? Inc. The self-lined material is black on the outside, white on the inside, making it suitable for backstage, soundstage or outdoor use. The dressing room’s portability is readily evident, as it’s easily transported with its own compact wheeled case, and is sized to ship by most major shipping services including FedEx. Committed to providing an ultimate experience in both drapery rental products and customer service, Rent What? Inc. is proud to be woman owned and operated. The firm, located in Rancho Dominguez, CA, has set the stage for artists including Beyonce, Nickelback and Demi Lovato. 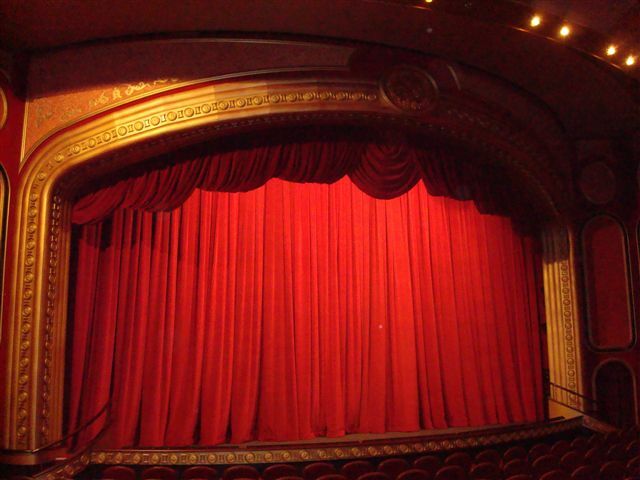 In addition to its large inventory of Inherently Flame Retardant stage drapes, traveler tracks and portable dressing rooms, the southern California drape rental company is widely regarded for its basic pricing schedules, innovative damage waiver policy and fast and friendly service. For more information on renting portable dressing rooms, contact Rent What? 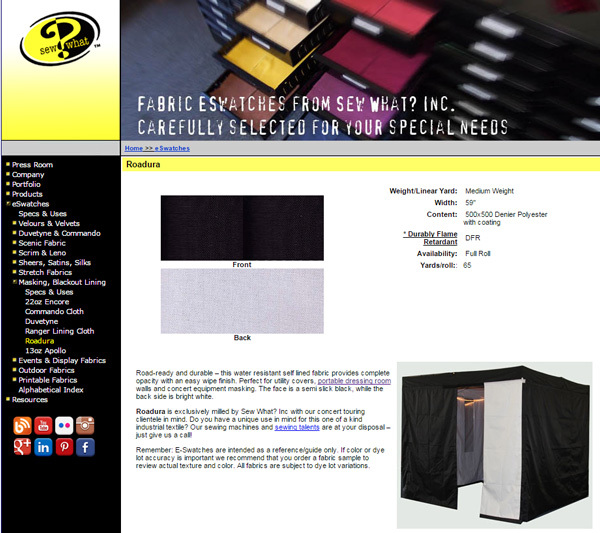 Inc. at (310) 639-6000 or visit https://sewwhatinc.com/rent-what-inc/. 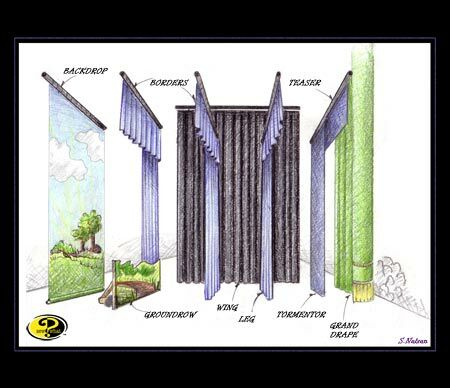 You’ve heard the term “Roadura” fabric – but what is it exactly? Roadura is a top performing textile that is road-ready and durable. This water resistant self-lined fabric provides complete opacity with an easy wipe finish. Our touring clients find that it is perfect for utility covers, portable dressing room walls and concert equipment masking. What makes the cloth so great is that it has both a black and a white surface. The face is a semi-slick black with a fine cordura-like finish, while the back side is a matte white coating. For outdoor stage skirting, this product is the bomb. The black side greets the audience, offers water resistance, and the white side gives the under stage crew a lightable area that won’t bleed thru to the audience. Totally opaque, this material wears many hats! Roadura also makes a fantastic substrate for a mixed media cut backdrop. Clients looking for a fully opaque material that they can “perforate” and then backlight – this is the best of the best. Seen on festival stages around the world and used as a base for many creative and dynamic backdrops in our construction history, we are always exited to see our Roadura “at work and on the road”. Roadura is exclusively milled by Sew What? Inc with our concert touring clientele in mind. Do you have a unique use in mind for this one of a kind industrial textile? 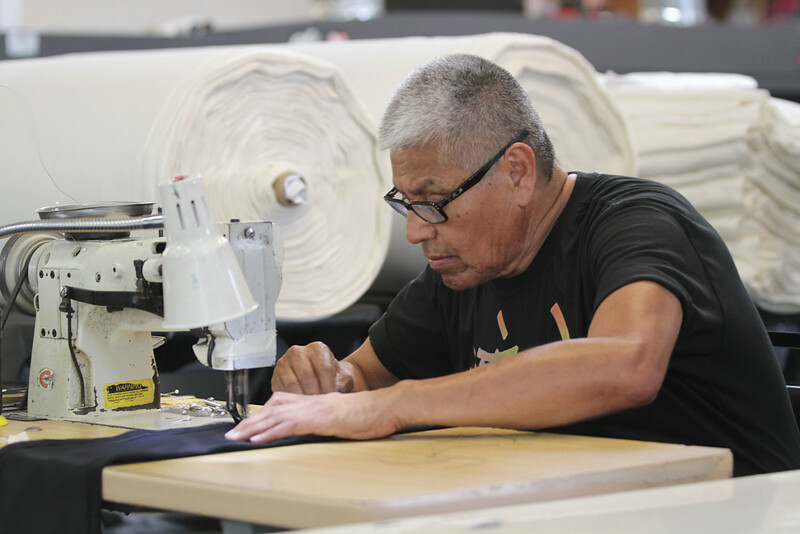 Our sewing machines and sewing talents are at your disposal – just give us a call! 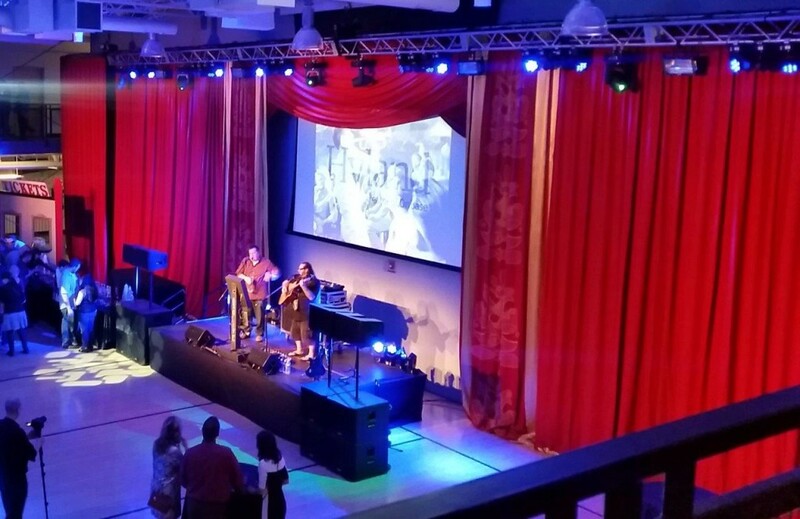 Mix of Rockin’ Red Rental Drapes Creates A Spectacular Look! While they had 10 “zones” in total that they had to design and decorate with a specific film’s theme, they knew that they wanted the largest zone to have a “classic cinema feel,” and so they contacted Rent What? Representative Carrie Johns to get some great ideas and suggestions for this important focal point of the event. Lead by innovative Event Designer Ryan Konikoff, and his skilled Production Manager Ryan Durfee, their team knew that they wanted floor to ceiling crimson red drapes with a traditional valance, and preferably some dazzling splashes of gold, too. Together they decided to go with some rich, velvety, dramatic drapes from our Rockin’ Red Drapery Collection, and it turned out to be a smash hit! 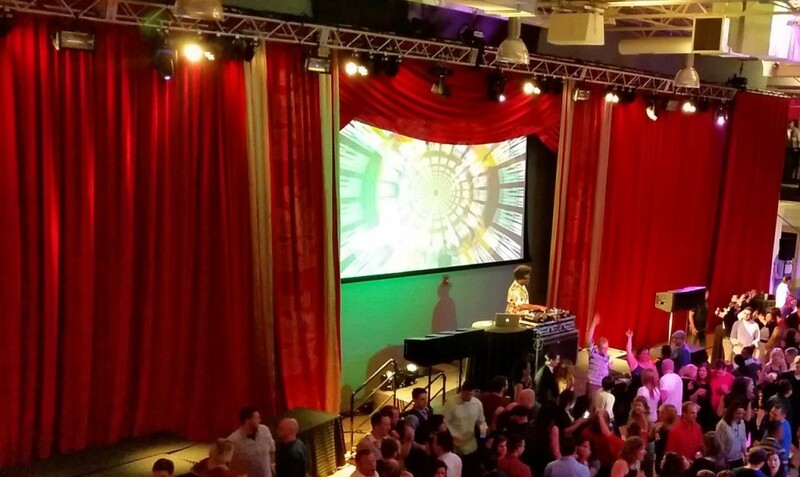 Using our spectacular 30’h x 31’w Crimson Cabaret pleated theatrical stage drapes, made of Encore Velour adorned with intricate gold printed detail and gold bullion fringe, with matching Crimson Cabaret border and pleated legs, as well as a 40’w Red Super-Vel swagged border, they were able to construct the exact look that their clients were hoping for. It was fantastic to see our drapes bring to life the classic cinematic feel in their renderings and sketches of this project! 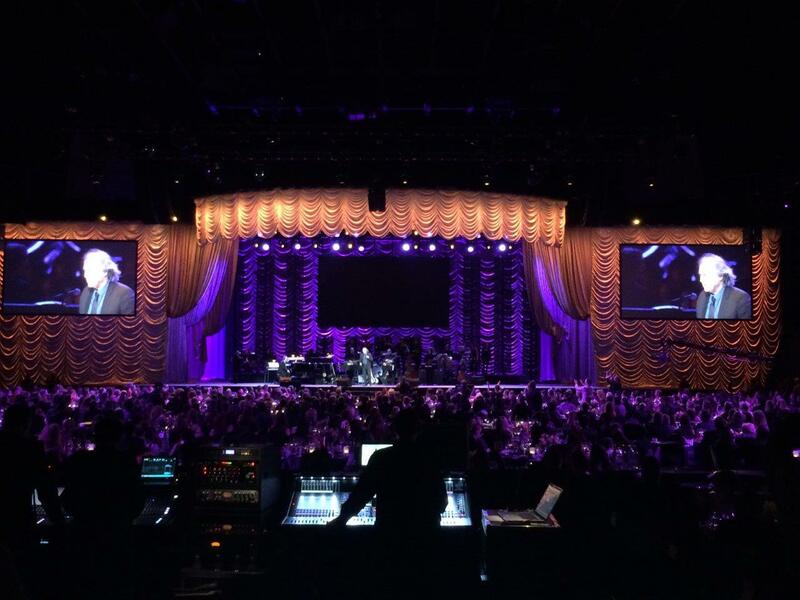 Hearing from their clients that “the amazing drape covering the big wall tied the whole event together” really made us very proud to be a part of such a stunningly memorable stage design. Photographed beautifully by Marissa Diaz, we can see how creatively mixing and matching drapes from the same drapery collection can create a breathtaking, one-of-a-kind event design. We’ve always loved working with Rock The House on many of their exciting projects, and we genuinely look forward to working with them again in the future.